This work is comprised of three series, each series contains four issues. It may be performed in a number of different ways; each issue or series may be performed separately or, the entire work, consisting of twelve issues and a Prologue, may be performed as a whole. In its entirety, the running time of “Strange Myths and Wondrous Images” is approximately forty-five minutes. Each issue represents an element: either an archetype, place, or an emotion, commonly found in comic book stories. 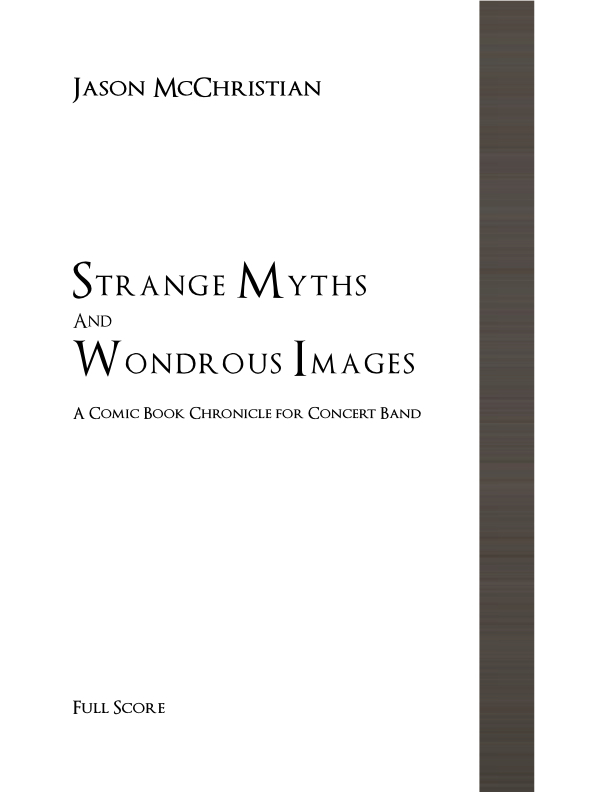 As a whole, “Strange Myths and Wondrous Images” tells a particular story arc, one that is intentionally void of specific details, inviting the listener to imagine the particulars. Each series also contains its own sub-plot and emotional progression, while the formal structure suggests the traditional symphonic form. Each issue has a duration of three to four minutes, limited to a small, but intensely expressive amount of thematic material. The challenge inherent in this limitation was to create enough contrast, yet not so much as to require more time to resolve it, therefore, each issue is self-contained. "TURNING ITS GAZE EARTHWARDS, A GREAT ENTITY WATCHES FROM THE FARTHEST REACHES OF TIME AND SPACE..."
"...CONCEALED IN THE CROWD, A STRANGER FEELS AN UNUSUAL RESONANCE SURGING FROM WITHIN..."
"...THE WORST DREAD APPROACHES THE CITY..."
"...AMONG THE DENSE CITYSCAPE, AN UNFAMILIAR PRESENCE WEAVES THROUGH THE CROWD AND THE NOISE..."
"...THE FORSAKEN OUTSIDER OFFERS HELP; A GIFT NO ONE CONSIDERED..."
"...A NEW TERROR IS ABOUT. TREACHERY AND SEDUCTION ARE ITS SPORT..."
"...WITH LIVES IN THE BALANCE AND HEROES AND VILLAINS IN THE FRAY, WILL GOOD ENDURE?..." "...A FINAL WAR IS UNDERWAY. THE HEROES GIVE ALL FOR THOSE WHO HAVE NONE..."
"...A FINAL DECISION MUST BE MADE, A FINAL SACRIFICE MUST BE PAID." "...A CALL FOR AID ECHOES ACROSS TIME AND SPACE. FROM THE CROWD A HERO EMERGES..."
"...STRENGTH IS SUMMONED AND PROMISES ARE MADE..."